Bits and Pieces...: CHA Crunch and a Webster's Giveaway! It's that time of year. And I love it! CHA! The craziness has begun. :) I love seeing what is being released. There are tons of gorgeous lines and I'm already drooling. Another fun part of CHA is getting new goodies on my doorstep. I got my first box from Crate yesterday! And let me tell you, the new lines are even more gorgeous in person. And then there are all of the gorgeous Webster's goodies. WOW!!! 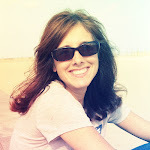 Check out Everyday Poetry. Here are a couple of my favorites of the new traditional papers. And these are the new clean and simple papers that coordinate with them. I love the subtle patterns on them. 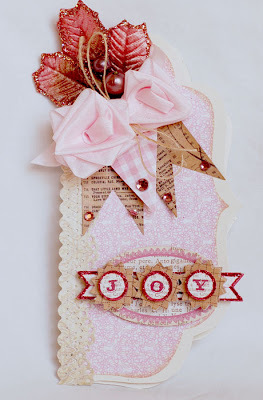 Be sure to head over to the Webster's blog to see the gorgeous embellishments and trims that go with these lines. AND there is a huge giveaway going on! I'm going to be hiding in my scraproom for the next couple of days working on projects, so if you don't hear from me, you'll know why. Everything on it is Prima. I love those little tiles. I hadn't used them before and they were fun to embellish. I used the little Prima resin flowers and painted the aqua one to give it a shabbier look. My next card was also for Emma's. Our challenge was to create something with ribbon. 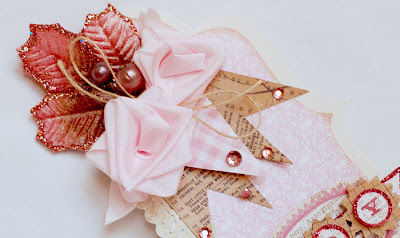 I made the ribbon flowers - a first for me. I made this one with some My Mind's Eye papers and stickers. The leaf cluster is Prima. Well, that's it for today. I'm going to sequester myself in my scraproom and crank out my CHA projects. Can't wait to be able to share them with you. Your cards are both truly gorgeous! 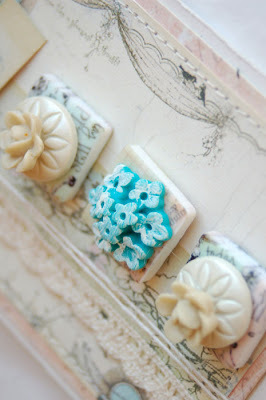 I just love how you used the tiles and resin embellishments! Can't wait to see how you'll use these beautiful new Crate collections too! I can't think of a better way to spend the day than locked in the scraproom! These cards are so beautiful! Love, love the first one in particular with those tiles and love your ribbon flowers on the second one. Everyday is my all time FAV! 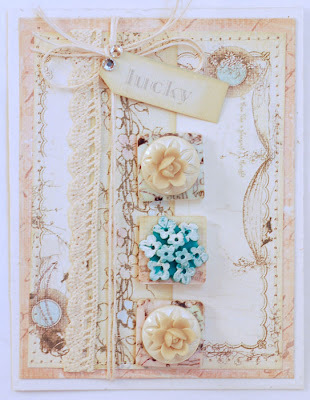 Lovely new goodies and gorgeous creations! ! I am always in love with CHA time! Love those new glimpses. Thanks for the peeks. I adore the papers. And I am going to hop over and check out more embelis. Your Emma card is wonderful. I love the layers and those resin tiles make me swoon. I wish I could be held up in my scraproom. I am with 3 sick kids who need to get better quickly. I am driving south on Friday for CHA whether they are better or not. Afterall my hubs is capable and he is going to have to step it up. This is the most exciting week of the year for a girl like me. Your projects are breathtaking. Love the color combos, design and embellsihemtns. Wow! 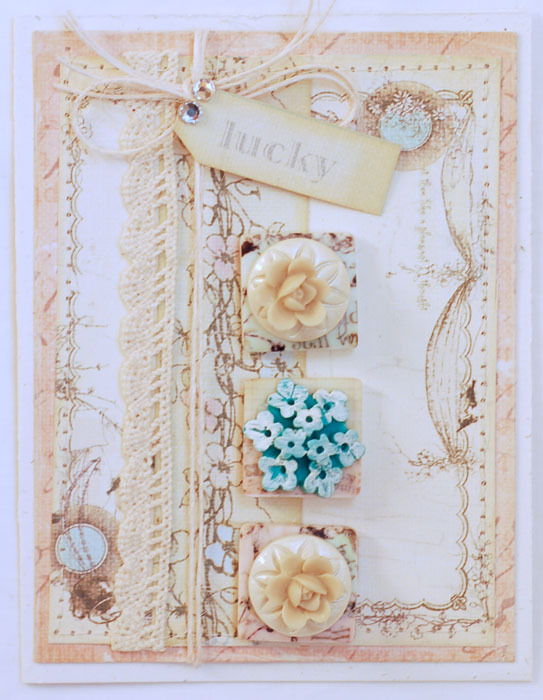 Gorgeous cards and yummy papers! Can't wait to get my hands on them!